When I look back and give myself a moment to ask, “where would I be now”, I can see that depression saved me from a life un-lived. So whilst we normally read heart wrenching stories about the destructive nature of mental health I’d like to ask, “is it possible that there are people who’s lives are saved because of it?”. Sometimes when you are suffering with mental/emotional health issues, you don’t actually know that’s what it is. As a teenager I struggled with an eating disorder for many years but it never occurred to be there was anything “wrong with my head”. I just thought I was fat. In my early 20’s I found myself feeling “weird”. I cried a lot, felt alone most of the time and generally just couldn’t feel happy. 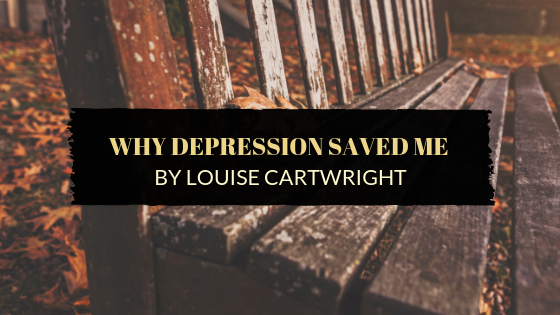 But depression became a real and debilitating illness for me after the birth of my children. It was well over a year before I contemplated that I wasn’t just a “freak” and that perhaps I had a problem. The depression stayed with me, in varying degrees, for many years. Being a mother to daughters who were just 14 months apart, was a struggle. Nothing felt real. It was like I was playing a part. Numbness was the best I felt. Darkness and despair were always waiting in the background. I have just two regrets from my days with depression. The first is that I lost the chance to enjoy motherhood and to be the mum I would have chosen to be. My darling girls could have had so much more. The second regret is that I have barely any memory of their childhood. Their first smiles; words; steps; days at nursery – I can’t remember them and I can’t ever get them back. Hindsight is a wonderful thing isn’t it? Looking back now, almost 20 years on and as an expert in mindset and high performance, I know one thing for certain. My depression was instigated by a belief that I didn’t have a choice. I felt trapped by my circumstances and the belief that I couldn’t change anything was the catalyst for my depression. I was 26 years old and I had created a life that I really didn’t want to be a part of. Deep down, I knew that changing my circumstances was the ONLY way that I would feel better but I just didn’t know how. One day it all just got too much and in an instant, I made the hardest decision I’ve ever had to make. I broke up my family. Emotionally I wasn’t strong enough to live another day in my current reality and I had to trust that I had the strength to cope with the alternative. That lunchtime as I drove to collect the girls from school, I remember taking my hands to my face and feeling the smile. It was the first smile in years that was actually connected to how I felt inside, rather than something forced. I cried. The fog was already lifting. I won’t pretend that that the new journey was easy. I was a single parent, had no job prospects, I was dealing with a lot of guilt and I had absolutely NO plan. I didn’t know about coaches and mindset. The idea of “consciously creating” a life wasn’t even in my stratosphere. But what I did have, for the first time in years, was hope. Depression may have robbed me of those memories but it has gifted me several things in return. It was the genesis of my journey to find out what I am truly capable of achieving in my life. I have proved to myself that I’m stronger and more resilient than I ever gave myself credit for. The dedication to be a lighthouse for my children, illuminating exactly how much they are capable of. A decision to get out of dead end jobs and start a business that I love. Above all else I THANK depression for setting me on the pathway of personal development. In those dark days, I couldn’t comprehend that life could feel this amazing. So full of opportunity and potential. No-one could have made me believe that someone as useless and as insignificant as me could be designing a life where she would be making a powerful and positive impact on the world. When you are drowning in those dark days and the voices won’t shut up I’d like to ask you, if only for a short time, to contemplate that there is something else that you cannot see. There is a door way out. It may not be easy but the rewards are magnificent. I would like to ask you to be brave enough to ask for help and to take some uncertain steps toward something new. Please remember that life is a gift, NOT a guarantee and you absolutely have everything you need to make that change.